MADE-ON-DEMAND ROUND-UP! #2: Crime Classics, Old Hollywood and New! Films of the early 1930s- particularly those from Warner Brothers, it seems to me- are full of all manner of oddities and curiosities. These are two of them, films that represent an under-recognized phase in the development of the police procedural as a trans-media genre. (Whether they are unique or represent a genuine production trend is “a researchable question” as David Bordwell would put it.) They are films that anticipate not only the television police procedural, particularly the post-Hill Street Blues ensemble procedural, but even their literary antecedents, the postwar police procedural novels of Ed McBain and, later, Maj Sjöwall and Per Wahlöö. Like so many of those, Bureau of Missing Persons is focused on a single division in a then-modern police station. Here, though, it is one without the obvious glamor of a homicide or even robbery division. The filmmakers try to offset that seeming deficit in a couple of ways. …and promising to show us the inside story of one police unit devoted to finding them. It then alternates among four major characters, each of them strictly hierarchized in terms of narrative importance and screentime. While most of those characters don’t pursue single story threads, the division of the film between them resembles the hierarchical structure of TV episodes, the alternation between detectives calling to mind contemporary television drama’s a/b/c/etc. plots. 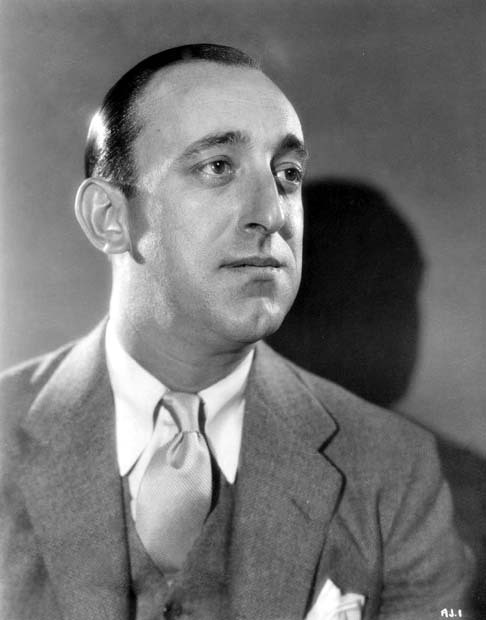 The “d” character does have a “d” plot: an officer played by Hugh Herbert (in an uncharacteristically straight role, though it has a comic payoff) is obsessed by one particular case, ceaselessly searching for one Gwendolyn Harris; the “c” character, though, played by the great Allen Jenkins, is seen pursuing a few lines of activity, including aiding the “a” character; the “b” character is the father-figure bureau captain, played by professional father-figure Lewis Stone; and the “a” character is Butch Saunders, played by Pat O’Brien as an arrogant, roughneck robbery cop who comes to the Bureau of Missing Persons. Being the star, O’Brien’s Butch must undergo a character arc, learning to be sensitive to the public and to use his brains and not his brawn. The interaction between Butch and Capt. Webb is critical to that arc, bringing Stone’s character center-stage, where he then proceeds to provide moral lessons to everyone who comes through his office in any capacity. Shortly, though, the balance is tipped in typical classical Hollywood fashion. Butch gets a love interest, a woman who is the focus of his major case. Bette Davis’ Norma Roberts is a woman who seems to be looking for her husband, but whose case proves far more complicated. 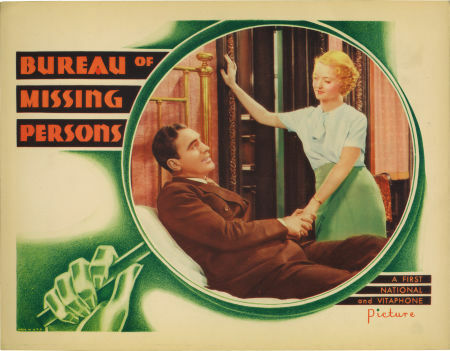 Initially, Bureau of Missing Persons seems to be presenting a look inside the operations of the bureau as a whole, giving equal time to all characters and bouncing from case to case. Eventually, in a paradigmatically classical maneuver, it settles on one main story: the search for Norma’s husband, the developing romance between Butch and Norma, and the complications that ensue when it turns out that Norma is a fugitive in a murder case. It becomes a vehicle for O’Brien and Davis, two important Warners stars. 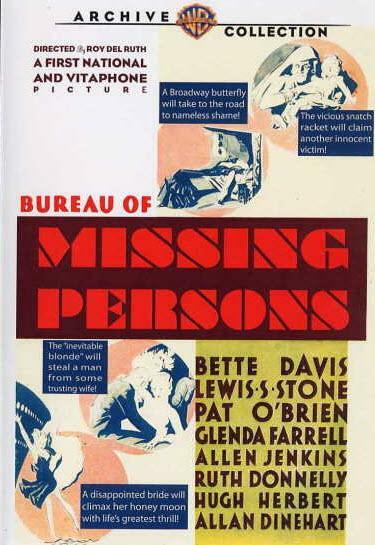 If finally Bureau of Missing Persons turns into a more standard Hollywood star-driven policier, to the last it periodically alternates among its characters and a succession of minor plots to maintain some sense of the ensemble drama, analogous to the likes of Grand Hotel and Dinner at Eight as well to television procedurals. Roy Del Ruth directs with a characteristic briskness, and an emphasis on character and performance that suits the material: the vividness of O’Brien, Stone, Jenkins, and Herbert in the end trumps the plot in pushing the ensemble to the fore. 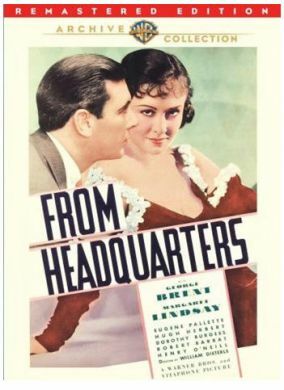 The same gradual tipping towards a male/female pairing happens in From Headquarters, but for me it’s a particularly unexpected film, and a particularly fascinating example of a genuine police procedural in 1930s Hollywood, one put together in ways that are more common today. 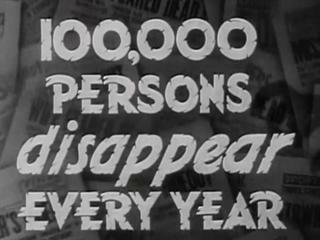 Like Bureau of Missing Persons, on one level, yes, it is a star-driven mystery, inflected with a romance subplot involving the chief detective (George Brent) on the case and his chief suspect (Margaret Lindsay), a melodrama of the sort- vaguely scandalous behavior, at least one aristocrat, the presence of the inevitable George Brent- that was pretty routine in the “pre-Code” era. 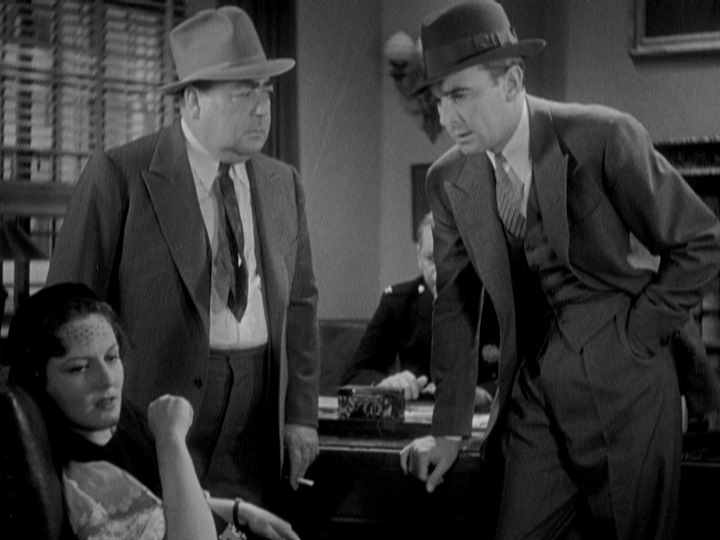 On that level, it’s passably entertaining, despite the fact that its basic mystery plot turns out to be as banal and obvious as, well, George Brent. A melodramatic moment between George Brent and Margaret Lindsay. That it drifts into that mode at regular intervals from about a third of the way through the film seems a sop to the marketplace (and the poster image, as reproduced on the DVD cover, above) as well as a bow to classical norms. But the other film here- and, let me underline, even more markedly than in Bureau, these are two different films that co-exist and interweave in a typically Warners brisk 64 minutes (which partly excuses the obviousness of the mystery)- is a genuine curio, a long-forgotten ancestor of CSI, likewise obsessed with forensic technology and procedure. Moreover, its focus on one station rather than one division provides opportunities to become a surprisingly ambitious, “realistic” survey of law enforcement practice. 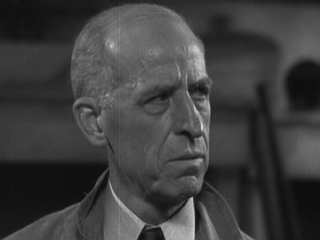 In fact, the melodramatic romance subplot, centering on Brent as the Lt., and Margaret Lindsay as the suspect/love interest, is in certain ways cleared up by the halfway point; romantic misunderstandings are cleared up and doubts are dispelled, though Lindsay remains an official police suspect for much more of the running time. Since Brent is convinced she’s innocent, and since this is not a film noir, her innocence is never in much doubt after that point for the audience, and to some extent this drains the mystery of any real stakes, though, again, the film is fast enough that it doesn’t matter. Too, the lack of stakes in itself is not that unusual in movie mystery plots of this period and style, which are typically more invested in the glamor of the star detectives/romantic partners. But those weren’t procedurals, or ensemble dramas; indeed, those films are typically based on puzzle-oriented detective literature, and From Headquarters would be a spectacularly bad example of a puzzle. 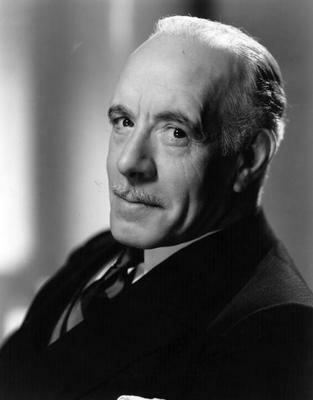 In fact, though it does share characteristics with early literary police procedurals, authors like Freeman Wills Crofts still emphasized the puzzle. Instead, From Headquarters anticipates by some decades the emphasis on procedure for realism’s sake (including its more banal aspects) in postwar crime fiction, and in television procedurals; it’s practically an anachronism. Like so many of those later procedural narratives, it is very much pronouncedly an ensemble piece, in important ways more so than Bureau, in that the case is solved not by one detective (as Butch single-handedly solves the case there), but by the cooperation and collaboration of all. Of course, where even commercial television procedurals play it pretty straight except for the token weirdo, as with Bureau, the cast of Warners contract players give it that specific urban flavor the studio did so well. 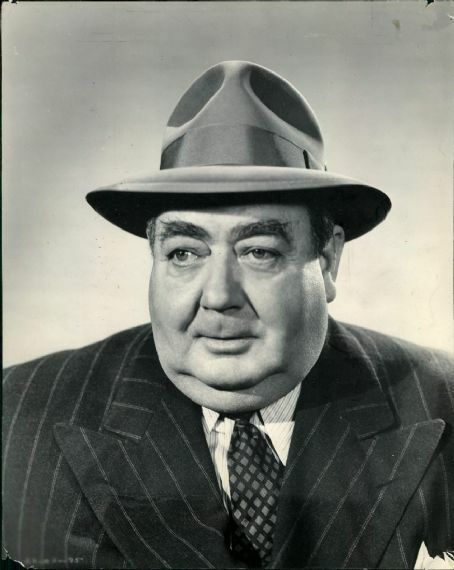 The cast includes a number of sharp players, including Eugene Pallette as the bullish sergeant (I think it’s safe to say every film Eugene Palette appeared in was improved by his presence, for his physicality as well as his comic timing), Edward Ellis as the crusty, murder-relishing forensics investigator (who to a substantial degree drives the actual crime-solving), and Hugh Herbert playing more to type here as the comic relief bail bondsman. These characters fill out the mystery plot but also giving us a feel for the entire police station, almost as a living organism, from the switchboard, to fingerprinting, to the pressroom (and who doesn’t love a wisecracking newshound? ), to the crime lab. In fact, the film never leaves the station except for flashbacks to the night of the murder during witness interrogation scenes (that in this way it recalls so many urban dramas and theater pieces of the era helps cushion the more unusual procedural aspects). This is one of the few films of this era that must be described in terms of the concept of encyclopedic narration, more in the sense that Bordwell uses in describing art cinema than in the sense used by Edward Mendelsohn in describing Thomas Pynchon novels (64 minutes compared to the 776 pages of my copy of Gravity’s Rainbow). It truly endeavors to provide a survey of life at a police station, from its opening scene of a group of men being processed, to its owlish attention to technology: firing a bullet into a crate of cotton to check ballistics, checking fingerprints, performing autopsies. Brent’s lieutenant, Pallett’s sergeant, Ellis’ examiner, and Henry O’Neill’s inspector solve the murder of a wealthy cad only by working together, doggedly pursuing their suspect through a combination of procedures, from forensic investigation to good old-fashioned interrogation. 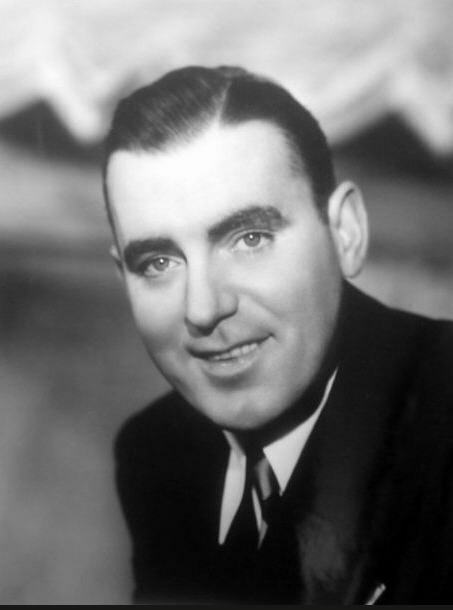 William Dieterle, an underrated director in general, captures the feel of the station with a flair for realism that counters his better-known reputation for the fantastic shown in A Midsummer Night’s Dream, The Devil and Daniel Webster, and Portrait of Jennie, and, in the Warners-programmer style, at a cracking pace besides (noting that supposedly, Michael Curtiz did some uncredited work on it as well). 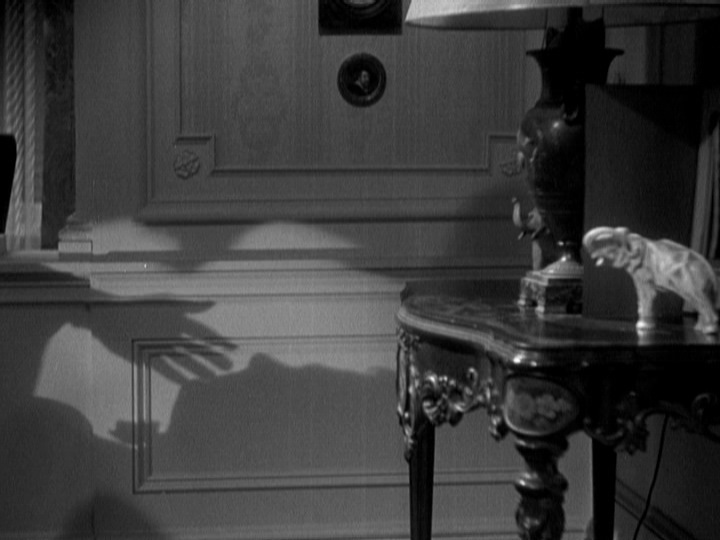 Having started as a point-of-view tracking shot, here the camera shifts to an objective view of a shadow on the wall to conceal what the character sees. His Germanic sense of style is here, too: each flashback is done in a single shot, long takes with elaborate and bravura tracking movements that, reminiscent of Murnau, oscillate between point-of-view and objective views on the scene. 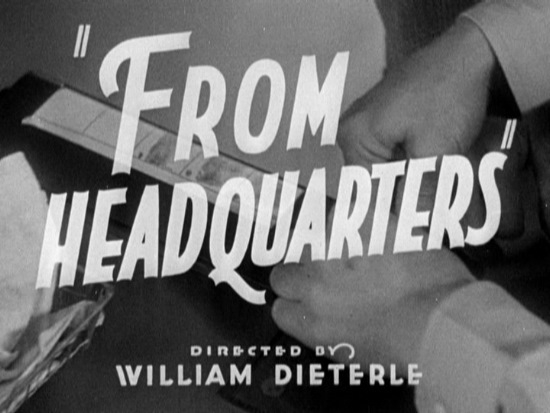 All in all, From Headquarters is an odd and worthwhile little film that deserves a lot more recognition in the history of the police procedural than it gets. Sure, I liked the Pink Panther movies growing up, like most kids in the ‘70s did. But since adulthood I have hated Blake Edwards. But I do like the first 2/3 or so of Experiment in Terror, a film that at least for a while manages to avoid the crude excesses, the grotesquerie and shameless mugging of Edwards’ lumbering attempts at comedy (I have a particular distaste for The Party; for many people, even non-Edwards fans, this film is defensible, I think because Edwards restrains himself a bit so as to mimic Jacques Tati- but I hate it because it makes me yearn all the more for the lightness of touch, the subtlety and playfulness, that Tati brings to similar material). So I took a chance on The Carey Treatment, another of Edwards straight thrillers. 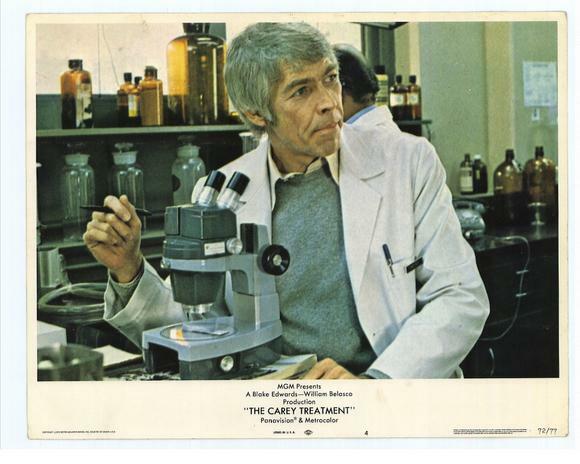 I’ve been wanting to see it for quite a while, in fact; I love James Coburn, and (as this post itself would indicate) I always like a ‘solid whodunit’, as Leonard Maltin labels it. For a while, the medical mysteries (it’s based on an early novel by a pseudononymous Michael Crichton) are engaging enough, and for a scholar of that period there is much of interest here. Outside of comedy, Edwards has a chance to indulge in the kind of realist aesthetics so prevalent then, with lashings of handheld camerawork and the like. But even in the first couple acts, Edwards never seems to get things into a groove. The pacing lurches from scene to scene, even within scenes; the film constantly pauses to allow Coburn to mack not only on the unbearably cutesy Jennifer O’Neill but also on a slutty nurse- moments after he’s been with O’Neill at a party he’s throwing. He returns to O’Neill (with paper plates of the chili he’s serving; acceptably manly fare for a party thrown by a guy) after the nurse turns him down, only to find her a little put-out by this, but he says, basically, Hey, don’t cramp my style, baby!, and Edwards seems to want us to like him for this. He wants us to like Coburn’s Peter Carey rather a lot, in fact, given how narcissistic, aggressive, and self-righteous he is. In fact, this is one of Coburn’s more unbearable characters, and so it remains impossible to care much about the whodunit. 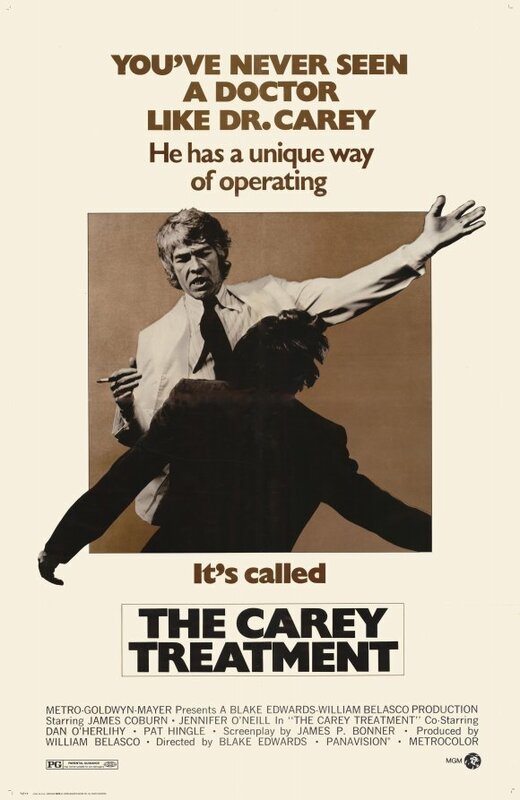 Then, in the last act, as usual, Edwards goes right off the deep end, ending the film with a barrage of ludicrous plot twists, and hyper-violent action pitting Carey against a maniacal masseuse (!). By the time the film was over, then, I was left with little else than the cold comfort that I felt my anti-Edwards prejudices had been confirmed again. This is an interesting film for a couple of reasons. In itself, it’s a brisk, entertaining heist film, and if you are a fan of that subgenre, it’s a solid entry worthy of your attention, if not quite a must see. If you are a scholar of 1970s Hollywood, it exemplifies a rather perplexing trend in that decade towards a very specific kind of nostalgia, one begins in a nostalgia for the classical Hollywood of the period in which the film is set, but goes well beyond that. 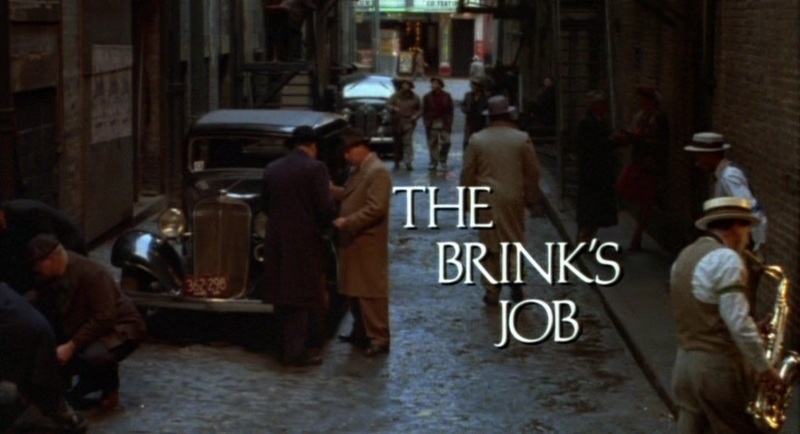 If you are a fan of William Friedkin, The Brink’s Job is a bit of an oddity, a film that comes after his major triumphs but still within his prime period, one that demonstrates both his strengths and his compromises with an industry in which his standing was beginning to falter. The presumption in watching this film, in light not only of Friedkin’s 1970s films but the twists and turns of his career across that decade, is that he took it on under pressure. 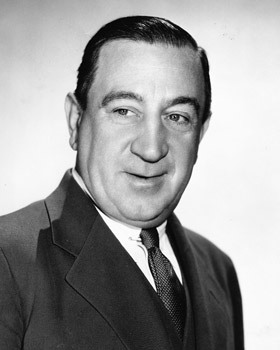 He had started the decade with two films back-to-back that were sizable commercial successes AND award-winning critical successes, The French Connection and The Exorcist. As with The Godfather, these were enormously popular, cultural phenomena even, while also boasting what was then a cutting-edge style drawing on art cinema techniques and strategies, notably in terms of objective realism. Taken together, these films went a long way toward demonstrating the commercial potential of a Hollywood art-genre cinema in that decade. Retrospectively, then, they are quintessential examples of the best, or at least most interesting, of what Hollywood was doing in that decade. But after The Exorcist, he embarked what was by all accounts a nightmarish production, one that went way over-budget and over-schedule, and was at the end of all that a complete flop: the infamous Sorcerer. For those reasons, it is often seen as a landmark on the road to the end of the 1970s Hollywood auteur cinema. A remake of a French film (Clouzot’s The Wages of Fear), that is if anything artier and less commercial than the original, the commercial and critical failure of Sorcerer means it is a landmark in the historical decline of the art-genre cinema more generally. That it is a superb, masterfully crafted, idiosyncratically bleak film, on that could only have been made when and where it was, makes it ripe for a re-appraisal that is well overdue (and which it will hopefully receive after its theatrical re-release and blu-ray release later this year). After Sorcerer’s long gestation and eventual release in 1977, The Brink’s Job follows in 1978 surprisingly quickly, so quickly that it seems doubtful that Friedkin had any hand at all in initiating the project. It is, quite evidently, a work-for-hire assignment in bringing Walon Green’s script to the screen. While it doesn’t seem to have been particularly successful, it is nonetheless the case that Friedkin’s next film, Cruising (1980), was a project he was much more invested in, and on which he seems to have had a fair amount of creative freedom. When it not only bombed at the box-office but was one of the most widely reviled films of 1980, Friedkin’s career never recovered. Compared to all the titles that immediately surround it in Friedkin’s filmography, The Brink’s Job is a distinct anomaly. The French Connection, The Exorcist, Sorcerer, and Cruising share a controlled craftsmanship; a cool, almost Langian detachmen; and, again like Lang, a pervasive bleakness at the hearts of the worldviews they embody (in the case of The Exorcist, for instance, there’s a tension between Blatty’s sense of redemption achieved through Karras’ self-sacrifice, and Friedkin’s sense of a yawning abyss just under the surface of the everyday). 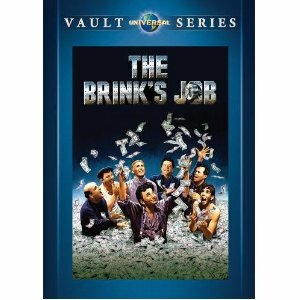 The Brink’s Job hints at that kind of pessimism in Warren Oates’ boastful but cowardly demolitions expert, but otherwise the film is dominated by a fond nostalgia for it’s vision of mid-century, ethnic urban life among the working-criminal classes. It isn’t sentimental exactly, but it is suspiciously warm and boisterous, at times a cooler version of what we would get in Woody Allen’s Radio Days or Neil Simon’s Brighton Beach Memoirs than even something like The Sting. At other times, unfortunately, it even turns into a knockabout slapstick comedy. The Sting remains an obvious touchstone, though: in The Brink’s Job too there’s the realist period depiction of city life and crime (in this case based on an historical incident), the earth-tones dominating the sets and costumes, the diffuse cinematography (seen throughout period films of the era in a visual attempt to signify ‘past-ness’), the jaunty score influenced by old-timey jazz and pop. This nostalgia for ‘20s-‘50s lifestyles and culture can be seen as a deracinated alternative to, but in some respects continuation of, the much more ambivalent sense of that period in Bonnie and Clyde (and the many, many ripoffs of and responses to that film, from Robert Altman to Roger Corman). For all the differences in form between those films, whether Thieves Like Us or The Sting and The Brink’s Job, and expressions of nostalgia like those of George Lucas’ for his boyhood pleasures in Star Wars, or his teenage years in American Graffiti, or the 1970s nostalgia for 1950s teen-culture generally, which, beyond American Graffiti, also encompassed Sha Na Na and Happy Days, these are clearly related trends. If one was going to think more about this, one might well read my friend Dan Marcus’ book Happy Days and Wonder Years: The Fifties and the Sixties in Contemporary Cultural Politics; one might also look at The Night They Raided Minsky’s, Friedkin’s first stab at period pictures, and for all its manic energy a far more cynical take on its subject. If Friedkin’s rendition of the period crime comedy-drama is weightless, it is also a lot more restrained and, therefore, agreeable than most. There’s not many grounds to compare The Brink’s Job to The Curious Case of Benjamin Button, but if you’ll indulge me, Friedkin is the David Fincher to Walon Green’s Eric Roth. Smack in the middle of this, though, is the robbery itself. 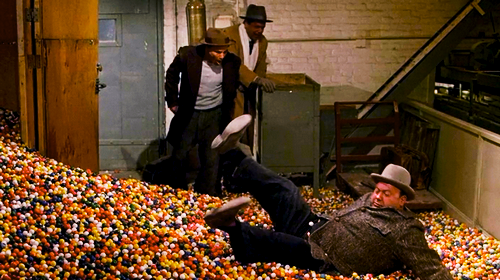 Now, this is not one of the top ten heist sequences or anything, but a Francophile like Friedkin was never going to miss the chance to do his riff on Rififi. So no, this sequence isn’t as gimmicky/innovative as the famously silent robbery in Jules Dassin’s film, but Friedkin clearly enjoys the technical challenges of staging a cinematic heist, and seems far more at home doing it than he is at anything else here. The heist itself is anything but clockwork as it proceeds for our heroes, and Friedkin makes a taut sequence out of it, one that largely dispenses with character-based humor, and consequently has both the precision and the chilliness of his other ‘70s films. The movie’s mixture of its elements is uneasy and a little unsatisfying, but it’s good fun, and worth studying if you like Friedkin, or ‘70s crime pictures, especially if they are period-set.